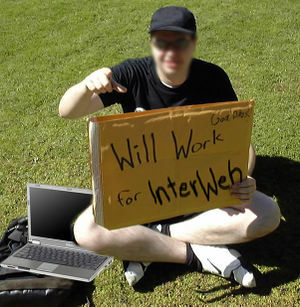 This homeless nerd will do anything for the internet. Homeless nerds, found in every major city, can be identified by their thick-rimmed glasses, tattered laptop cases, and plastic bags full of assorted cables and surge protectors. Homeless nerds often roam around the subway and coffee shops looking for wifi hotspots and batteries, but recently they have begun to form gangs. These gangs wander the streets, mugging businessmen for their laptops and starting gang fights over whether Kirk or Picard was the better captain. Such conduct is uniformly considered to be immature and childish (because we all know Picard was the better captain, and James T. Kirk was probably gay—proved by the fact that he never did Lt. Uhura). Although nerds have graced the planet since the early ‘80s, it wasn’t until the early ‘00s that many nerds lost their comfortable place in their mother's basements playing games such as World of Warcraft and making peanut butter sculptures and were sent out among the homeless. Homeless nerds can now be seen all across the many metropolises that grace this fine earth. The most notable cities to find large Homeless Nerd populations are: Chicago, Philadelphia, New York, London, and Ludington, North Carolina. 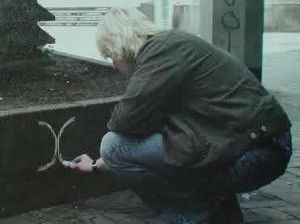 One nerd makes his mark. Luckily various Nerd relocation programs have begun due to the efforts of youth at Atom’s College. Many of the previously homeless nerds are finding places to stay in foster mother’s basements. Also, many of the previously homeless nerds are settling for rooms over garages, attics, and trailers; thus allowing for wider placement of nerds. “We cannot allow Nerds, homeless or otherwise to be subjected to the streets. They need special care.” Said Gabriel Legend during one of her rare interviews. The elusive writer, and nerd’s rights activist is also the foster mom of several previously homeless nerds. “They were all troubled nerds. It's hard to find a place for them. Society doesn't want them. The other homeless don't want to be seen hanging out with them or even sitting near them at lunch." 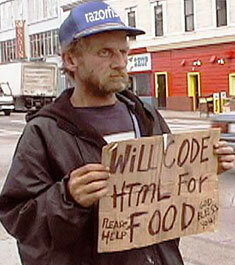 Most homeless nerds use their massive skills to reduce their hotpocket cravings. However, others are less interested in helping the homeless nerds and supporting nerd shelters. "Enough is enough," said the director of San Francisco's Homeless Support Network. "We're willing to put up with the alcoholics, the knife-wielding schizophrenics, and the heroin addicts. But we're drawing the line at nerds. I mean, it's one thing to have people harassing pedestrians for beer money, passed out on the sidewalks, or defecating on the streets. 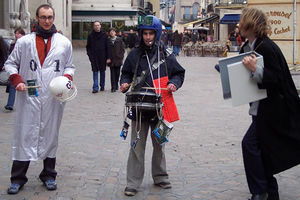 But these guys are really uncool and they're making the streets of our fair city totally lame. I mean, DC—where most of the homeless are former jocks and cheerleaders—is making fun of us. Who will want to be our friend as long as we've got these guys hanging around?" Notable for their unusual dress, nerd gangs can be extremely dangerous. Nerd gangs are most notable by their unusual tag sign (sometimes referred to as WARchalk) and their unusual style of dress. The Noobs and Hackers are names synonymous with Hell's Angels/Grannies among nerds. Their strong influence can be seen not only online but also on the many subways, buses, and airports of this planet. Nerd gangs are most active during the daylight hours, enraged by the sunlight on their sensitive skin. Nighttime is the best time to avoid Nerd gangs, unless you live in Europe in which case it is safer to avoid traveling alone at any time. Too many people have suddenly turned around as they were going home and found their laptop creaking in the wind, an empty shell thanks to the attention of a nerd with fast reflexes and a screwdriver. Carry a bar of soap and a comb. Few things keep a nerd at bay like the threat of good personal hygiene. Travel with female companions. The thought of having to interact or maybe even speak to a woman will make nerds too nervous to approach. Most nerds will be unable to speak, or code much of anything with a female present. Often this will leave them susceptible to attacks, and allow you to disable their systems. Avoid places where nerds congregate. It is wise to avoid all hotspots, particularly Panera Bread, or any gaming shop after hours. Another spot to avoid is Starbucks. They can often be found here, arguing about whether Mac, Windows or Linux is the best, while begging for money for coffee. Never carry a laptop case. They will steal it in hopes of finding software disks or extra RAM. Also it is wise to refrain from using PDA devices in public. Many of the homeless nerd population find PDA devices very appealing. They are also known to steal calculators, light up pens, and batteries. It is best not to carry or advertise the use of any of these items in areas known to harbor nerds. Be on your guard for LAN party hijacking. In extreme cases, nerds have simply wandered or hacked into a network while the actual user was away, slowly resulting in a building completely overrun with 48 Hour long sessions of Starcraft and mass Everquest or Runescape clans, often moving as a collective unit. The building often has to be evacuated by non-nerds as highly skilled nerd recovery teams coax them from their computers or laptops using caffeinated beverages, Cheetos and, particularly, Twinkies as bait. In very bad cases, the building has been abandoned to the nerds, and often becomes a nerd shelter when the authorities manage to get into the unused rooms. Ask him what he thought about Attack of the Clones. While the nerd works himself into a fever ranting about the poor acting, Jar Jar Binks, and the superiority of the Battle of Hoth to the computer generated special effects, you can make your getaway. You can also mention Lucas' decision to make Greedo fire first in the Special Edition of Star Wars. Yell "Klingon Invasion" and run. This will buy you about a minute and a half. The average homeless nerd doing what he does best. There are a number of ways to help homeless nerds. First of all, donate your time or money to the local nerd shelter, nerd soup kitchen or nerd charity. To help socialize the nerd, try to engage him in conversation about non-nerdy topics, such as girls or sports. Dispose of your old technology properly. Left lying around in street, it can easy attract nerds, who will then fight over it. On your front lawn. Don't give nerds money. The nerds will typically say that the money is for food, a cup of coffee, or a bus ticket. In reality, they will spend it to support their ribald habits and blow the money on Dungeons and Dragons dice, memory for their laptop, and their online gaming addiction. Giving the nerd money only encourages him to continue acting as a nerd. This page was last edited on 4 November 2014, at 03:18.